Phil and I were talking about age and elevation, as we climbed over the rocks to Clover Leaf Lake, at ten thousand feet. The first day of backpacking was hard. We hiked all day. At Martin Lake, I was stumbling with fatigue. It was eight miles, the last couple a monumental grind up a mountainside of roots and rocks. We’re hiking in the Beartooth Mountains. I didn’t know where they were on a map eight months ago. The range straddles the Montana-Wyoming line just northeast of Yellowstone. They are not the youthful Tetons, still pushing pointed fingers into the sky. The Beartooths are high, but hunkered down and massive, great blocks of billion-year-old granite, autochthonous rock the geologists would say, sculpted by the eons into sheer walls and plunging valleys. Into the 1880s they were impassable, until a coal miner from Red Lodge, a missionary of the Almighty Buck, found a way. His trail is now Route 212, which runs from Red Lodge, Montana, over the mountains to Cooke City, just a few miles from the entrance to Yellowstone Park. It is called the Beartooth All-American Highway. From the prairie at Red Lodge the road winds up through piney hillsides – blackened from recent fires – to a series of dramatic switchbacks. Around hairpin turns, the road climbs above the timberline, to distant views of gray mountains. The skyline is not one of jagged peaks – the “bearteeth” we were expecting – instead, a vista of lofty Olympian meadows overlooking the world of mortals below. Along the highway, the steepness creates the danger of falling rock, cobbles of which lie here and there in the road. In more active areas, enormous steel nets, anchored by heavy cables, catch the debris. At one troublesome switchback, in what looked like an act of desperation, the road crews had simply covered the entire hillside in concrete. At the passes – there are two of them between Red Lodge and Cooke City – the terrain is alpine, a russet brown skin, like the hide of huge beast, pocked by rocks and a few sprouts of grass. The wind never stops blowing. An hour or so out of Red Lodge we stop at the Top of the World, a general store in the middle of the Beartooths. It is an improbable place, miles from anywhere, run by a fellow and his family who live in a few rooms in the back, selling gasoline, snacks, fishing lures and Wild West gifts. This week there’s a biker rally. Wherever we go in the West we seem to find ourselves in the middle of some sort of biker festival. Each time we visit Top of the World, on our comings and goings, there are motorcyclists flying colors from some Ohio or Illinois town. These motorcycle groups are no longer the monopoly of young sociopaths. All of these folks are middle-aged, with graying hair swept into pony tails, and heavy paunches corseted in black leather. It was my turn to plan this year. I found a bed-and-breakfast in Red Lodge, with big rooms, good breakfasts and a hottub. I also culled from the guidebook a trail with a six mile hike to a cluster of lakes where we would make base camp for three nights. The trailhead, I boasted to my friends, was the same elevation as our destination. It would be a stroll. It wasn’t. The book said six miles to Martin Lake. 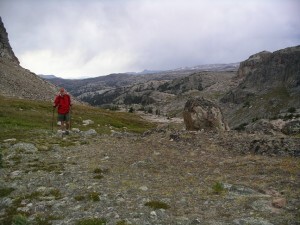 We left around noon from Clay Butte Lookout, trending down to Native Lake. As we hike, Leetz entertains us with discursions about the Civil War. We emerge from the pines into a meadow on the flank of Clay Butte. The trail runs the high edge of the meadow, which tips gently away from us, before disappearing into a steep valley. Across the valley the mountain range seems close enough to touch. Leetz is now regaling us with descriptions of the neurosis of Civil War generals – Lee, obsessed with shame, Jackson, phobic about – of all things – pepper. It looks like it could be a long hike. It was a long pull from Native Lake up to Mule Lake. 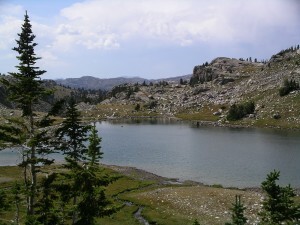 The Beartooths are filled with “tarn”, the term for the myriad lakes that dot the mountains like jewels. There are nine hundred of them in the Beartooth-Absaroka Wilderness, fed by glaciers and filled with fish. They are waypoints in a great staircase. Reach a lake, take a break, hike up to the next. Somewhere after Mule we crossed from Wyoming into Montana. It was down and down – and then up; it was now growing late in the afternoon. We came across a couple of hikers on their way out. They warned that we were still a couple of hours from Martin and it was a tough climb. We decided to keep going. The book said Martin Lake was so abundantly beautiful that it could not be missed. And we were, after all, veterans of the pack trail. We soon found ourselves on a climb that wouldn’t end. Strapped to 40-pound packs, we climbed and climbed, over roots and rocks, up the staircase. I was breathless. The day before I was breathing Ellijay’s sweet and profuse oxygen. There was no oxygen that I could detect up here, and my body was sagging. Up ahead, a few hundred yards away, I caught a glimpse of sky – the top, and surely the lake. It was a lake sure enough, but not ours, and the trail disappeared at the foot of another escarpment. It went on like this: a difficult climb, a view of sky at the top … and another climb. My gait became leaden, one boot dragged in front of the other. My legs were starting to give up. My left thigh began seizing in a spasm. The pain in my back and hips from the pack was getting worse. My shoulders ached. I had run out of water. It began to rain. Leetz was ahead somewhere. Behind me were Phil and Jim, I didn’t know how far. I hadn’t seen anybody in a while. At the top I found Leetz. There were no greetings. We looked at each other. Looks say it all. Phil and Jim appeared. They had the same hang-dog look. No sign of the lake, but no climb in front of us either. We started down. After a mile or so we crossed a shallow stream where I stumbled so badly, from pure exhaustion, that I almost fell in. We found a clearing and sat down. I was having a hard time thinking clearly. The nice thing about high elevation exhaustion is that 75% of it is oxygen depletion. Fifteen minutes of just breathing, without carrying that hateful pack, is a pretty good cure. We needed tents pitched, firewood gathered, stoves fired up, wet rancid clothes changed. As darkness fell we were finishing dinner and stoking a fire. Clouds that had cast a pall on our preparations cleared. Above us stars filled the sky. It must have been a sky like this that inspired the name of the Milky Way. Around the campfire we argue. We’re talking about depression in the cultural context. Two of my friends are psychiatrists, for whom the topic has some professional interest. Ken and Jim are happy to argue. How can any discerning human being deny the evidence of depression all around us. All those hopeless housewives and overbearing husbands, all that sleeplessness, substance abuse, sexual dysfunction. All that lost earning potential! The answer is that life isn’t pretty; and for many it’s just plain awful. But if anesthetizing ourselves with some pill is what the doctor orders, well, I’m not sure the doctor is helping. Some people, true enough, are really sick, and you may call their illness whatever you like, but taking every miserable housewife and her angry husband and putting them on Wellbutrin is problematic. The legions of modern psychiatrists, once guides to the unconscious roots of human despair, are now quartermasters for the chemicals that provide the solace that was once the province of communal life. But maybe that was the sore legs talking. The next day was sunny and warm. Phil and I went down to fish. It is my lot that I’m the guy who buys the fishing license, the lures, lugs the pole and tackle, and the other guy catches all the fish. Wright Lake was full of brook trout, who darted here and there in the shadows of the clear water. I could not interest them in my gold spinner. Phil, however, harboring a talent I had never seen, with my same gold spinner, was soon hauling them in one after the other. An hour later we left camp and headed to Clover Leaf Lake, yet another step up the staircase. We skirted the shore of Wright, and hiked up to the next watershed. We promptly lost the trail in a meadow braided with streams. Straight ahead, a cleft in the mountain looked like the direction of Clover Leaf. Without a trail, we scrambled over boulders, climbing up into the notch, where we traced the flank of a narrow gorge. At the top the terrain leveled off, and turned uphill, gently this time, along a stream, which emptied into the lake. Here, at what felt like the top of the world, I cast a lure into the deep blue water, and a fish hit. My friends, wholly without licenses, poles, or for that matter, skill, knowledge or experience, lined up. It was a fine afternoon. Few fishermen hike to these distant pools, and the fish were jumping into our laps. We filled a ziplock bag with trout. The cutthroat were a foot long. Camp was lively that night. Freeze-dried food tastes better with trout. Another threat of rain passed and the stars again crowded the sky. The next day we wandered up and down the lake country. At each promontory a blue lake sparkled at our feet. We descended into Green Lake, 400 feet down an endless series of steep, dusty switchbacks. 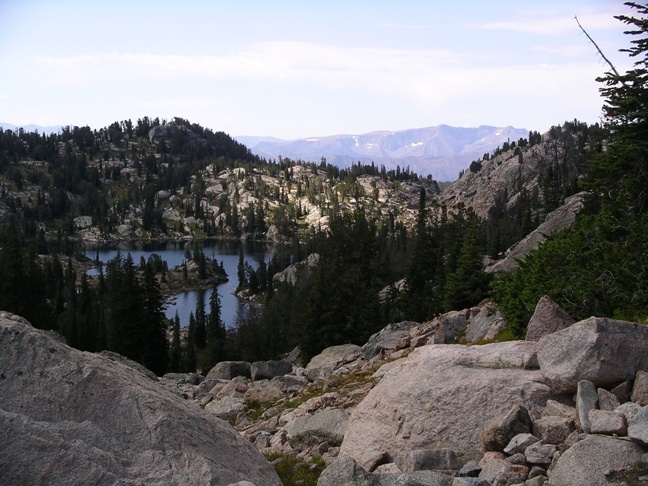 We hiked up to another lake, over a morass of boulders. The boulder fields are slow going. At a break on the shore, we noticed two backpackers approaching from the far end of the lake. They were the first hikers we’d seen all day. They were in full packs, headed for the boulders and Green Lake. They were old, at least late in their sixties, maybe seventies. They were a husband and wife from Red Lodge, and had just climbed Castle Rock, the highest peak in Carbon County. They had been doing this for years. I’ve already forgotten his name. Her name was Betty. They were skinny, weathered old folks, looking fit as mountain goats. Their packs were old, the bedrolls looked like film props from Treasure of the Sierra Madre. They were friendly, chatty. They never sat down. Finally they swung around and headed toward the boulder field. In Red Lodge, a couple of days later, we ate dinner on the patio of a restaurant on Broadway, the main street here. The sidewalk was busy. Red Lodge has not yet made the A-list of Western resort towns, so it lacks the gentrified look of Park City or Ouray. The Californians have not yet landed. Dwarfed by the Western landscape just beyond the rooftops, little towns like Red Lodge feel comfortable and homey, like a campfire in the outback.After dinner we drove out into the prairie, speeding almost weightless over the flatland, listening to the music we listened to as teenagers, already thinking about tomorrow’s flight back home.